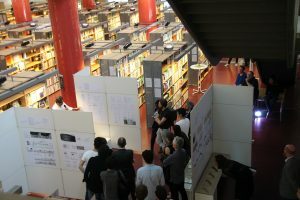 Throughout the 2016-17 winter semester, the graduate seminar Urbanisation, Cities and Environment taught by Gunnar Hartmann at DIA Graduate School of Architecture explored the potential aims and means of achieving integrative urban design practices in the future. The seminar was organised around a number of lectures delivered by a variety of experts from the German Environment Agency (Umweltbundesamt, or UBA). Lectures, seminar discussions, and collective research led to the collation of data on a wide range of environmental topics that address climate change, i.e., energy transformation, urban resources and consumption, land use, transportation and mobility, and outdoor air quality. The prime focus of the UBA lectures was Germany’s Energiewende initiative as well as UBA’s study for attaining a greenhouse gas-neutral Germany in 2050. Structural policies, instruments, and regulations as well as the aims and projections behind the initiative and study were presented. 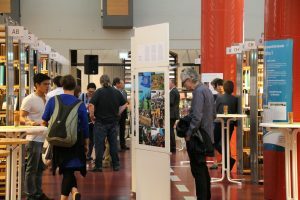 Exhibition at the German Environment Agency (UBA) in July 2017.